When you’re tired of sand dunes, dangerous abandoned mines, and yet another interpretive sign, there’s only one place left to go in Death Valley: The Place Where The Rocks Move. A few rough miles from the end of the road (the paved one) lies one of the most weird and beautiful locales in this most desolate of National Parks, and it is complete with rocks that “race” each other, leaving tracks of their otherworldly movement behind for passersby to marvel at. Most packaged tours and the blue-hair crowd stop at the spectacular Ubehebe volcanic crater at the north end of the Valley. Just before the start of the short loop that takes them to the lip of this quarter-mile deep hole, a track cuts off through the lava and recedes into the Southwest. An unassuming sign posted at the intersection reads “The Racetrack—27” (miles, that is). It’s slow going. 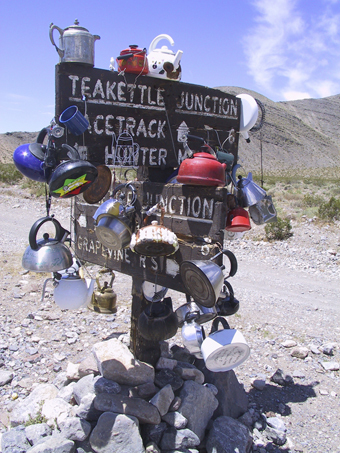 When you reach Teakettle Junction, (see sidebar) you’re nearly there. About an hour of heavily washboarded gravel road rewards your vibrating eyeballs with the sight of beige smear along the bottom of a huge valley. Your highly developed aesthetic sense thrills at the simplicity of the scene. A sizeable conglomeration of uplifted bedrock called “The Grandstand” juts up from the center of an ancient dry lake, which stretches to the base of the bare mountains that surround it. Step onto the dried mud—look at it closely. The floor of the valley is covered with a countless expanse of tiny cracks, stretching to the horizon. You could follow one of these infinite clefts anywhere on the playa without stopping. Be thankful you’re not on psychedelics, or this would be sensory overload. Conversely, if you are, write in care of the publisher and tell us what it was like. There is no camping allowed in the Racetrack Valley, so this experiment would necessitate a “daytrip,” or a very dangerous drive out in the dark. It’s about a 10-minute walk from the first pullout area and ubiquitous Park Service information sign to the Grandstand. The blackish-brown outcropping, about 100 by 500 feet, still resembles the island it once was. The demarcation between dry mud and hard rock is gradual, and rings the formation like a soft halo. Climb up the 100 feet or so to the top and have a look around. The dark, rough rock is stippled with a beautiful pattern of lighter, reflective strips of some mica-like compound. It’s positively hallucinatory. Don’t look for the traveling rocks here. This is just the prelude. The hearty might want to make the two-three mile walk to the southeast end of the racetrack to see the main attraction. Laziness (or heat—in the summer months) draws one back to the car and a short hop south to the next pullout/ sign. Head almost due east across the lakebed for about 15 or 20 minutes until the floating, shimmering black dots on the horizon resolve into hundreds of very dark, scattered rocks. The mysterious rock race apparently moves at glacial speeds, and no one has ever witnessed the things actually moving, but the evidence is clear: smeared depressions all end at a rock—some of the tracks are hundreds of feet long. It’s as if some spectral hand decided to use the mud as a doodling pad. A few of them are ramrod-straight, many others curve, zigzag, and even turn back on themselves. It’s creepy and exhilarating at the same time. Many of the rocks have even pushed up a lip of dried mud in front of them, which blows the away the “rocks-move-by-wind-pushing-across-frozen-surface” idea. Even super-hurricane-like winds would be doubtful as the culprit, since they would likely not be able to push the larger stones. The nail in the coffin is the fact that only a very few appear to have moved in the same direction. Selective winds? How the hell did these things get out here anyway? Some are at least a half-mile from the nearest mountain. Perhaps they have been traveling for millennia. 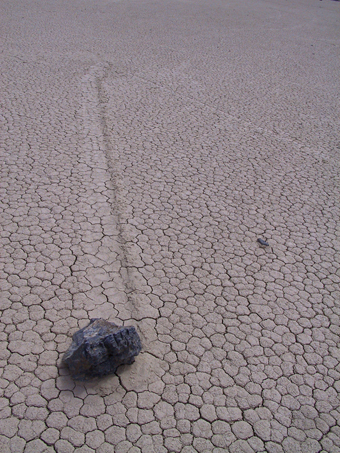 In his excellent book The Rebirth of Pan, author Jim Brandon remarked that the mud flats are honeycombed below ground with abandoned mine tunnels, and theorized that some kind of Gaian force is present in such places (there are at least three other “racetracks” on other dry lakes) and delights in the apparently pointless lark of moving rocks when no one is looking. There are rumors that there have been attempts to photograph the rocks in time-lapse, but I could find no evidence of such a study. The rangers hadn’t heard of such a project.